Those protesting do not represent Venezuela’s vast working class majority that struggled to overcome the oppressive exclusion they were subjected to during administrations before Chavez. The youth taking to the streets today in Caracas and other cities throughout the country, hiding their faces behind masks and balaclavas, destroying public buildings, vehicles, burning garbage, violently blocking transit and throwing rocks and molotov cocktails at security forces are being driven by extremist right-wing interests from Venezuela’s wealthiest sector. Led by hardline neoconservatives, Leopoldo Lopez, Henrique Capriles and Maria Corina Machado – who come from three of the wealthiest families in Venezuela, the 1% of the 1% - the protesters seek not to revindicate their basic fundamental rights, or gain access to free healthcare or education, all of which are guaranteed by the state, thanks to Chavez, but rather are attempting to spiral the country into a state of ungovernability that would justify an international intervention leading to regime change. In 2007, these student groups, funded and trained by US agencies, took to the streets of Caracas to demand Chavez’s ouster after the government chose not to renew the public concession of RCTV, a popular private television station known for its seedy soap operas. The protests were composed of mainly middle and upper class youth and opposition politicians, defending corporate media and a station also known for its direct involvement in the April 2002 coup. Though their protests failed to achieve their objective, the “students” had earned their credentials as a solid fixture in the opposition. Later that year, their organizing helped to narrowly defeat a constitutional reform package Chavez had proposed in a national referendum. Ironically, international media have been portraying these protestors as peaceful victims of state repression. Even celebrities, such as Cher and Paris Hilton have been drawn into a false hysteria, calling for freedom for Venezuelans from a “brutal dictatorship”. The reality is quite different. While there is no doubt that a significant number of protestors in the larger marches that have taken place have demonstrated peacefully their legitimate concerns, the driving force behind those protests is a violent plan to overthrow a democratic government. Lopez, who has publicly stated his pride for his role in the April 2002 coup against Hugo Chavez, continues to call on his supporters to rally against the Venezuelan “dictatorship”. 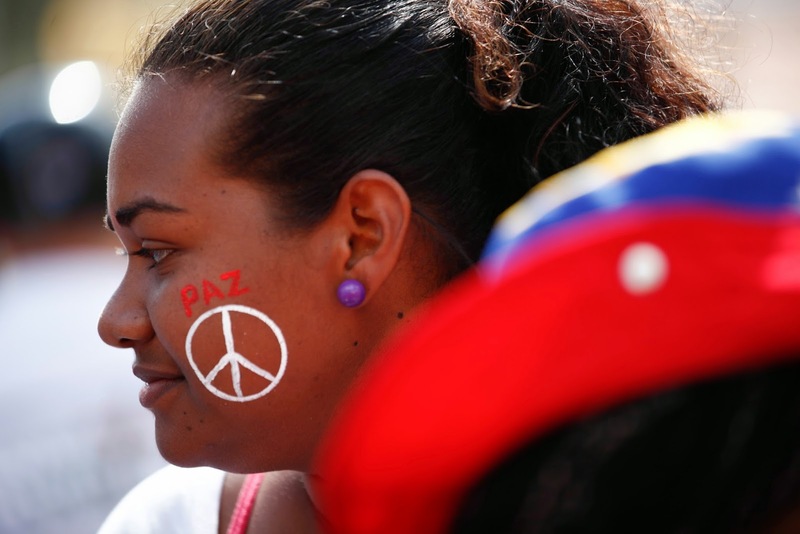 Most Venezuelans want peace in their country and a majority continue to support the current government. The opposition has failed to present an alternative platform or agenda beyond regime change, and their continued dependence on US funding and support – even this year Obama included $5 million in the 2014 Foreign Operations Budget for opposition groups in Venezuela – is a ongoing sign of their weakness. As a State Department cable from the US Embassy in Caracas, published by Wikileaks, explained in March 2009, “Without our continued assistance, it is possible that the organizations we helped create...could be forced to close...Our funding will provide those organizations a much-needed lifeline”. While problems persist in the country, as they do every where, most Venezuelans are wary of giving up the immense social and political gains they have made in the past fourteen years. An opposition with nothing to offer except foreign intervention and uncertainty does not appeal to the majority. Unfortunately, media fail to see this reality, or choose not to portray it in order to advance a political agenda. In Venezuela, the revolution is here to stay and the interests of the 1% are not going to overcome those of the 99% already in power. Those puppets in Altamira and other áreas of Caracas who are currently blocking the avenues don´t realize that the hidden intentions of their leaders are to show the wordl that there is a "dictatorship" in Venezuela and eventually attack our country. May God help us! The Bolivarian revolution is strong and resists, people struggle peacefully, the people elected the people, the revolution defeated fascism wherever it appears. I've been checking your site every day to see if you are reporting on the developments on the ground. It's hard to know who to trust about what is going on in Ven., but I know I can trust you! I hope you will continue to update your reports. There's lots of people counting on your honesty. Thanks for your effort in keeping Chavez's vision alive. ¡Hola Eva! He de decir que es un artículo muy preciso e interesante, siempre es importante conocer el lado "B" de la noticia. Gracias por ayudarnos a comprender más lo que actualmente ocurre en Venezuela, es de gran interés para muchos hermanos latinoamericanos; en México no estamos muy lejos de ello. Te sigo en FB y en RT. Sería un placer y un honor que visitaras DREAMWISHMAKER en http://www.facebook.com/dreamwishmaker1 y/o http://www.wix.com/dreamwishmaker/main http://twitter.com/dreamwishmaker ¡Saludos Eva Golinger! What did CNN say to be read the riot act by the President of Venezuela? I find it interesting with all that is going on in Venezuela, very few, if any of the local TV stations are covering the situation live. Very unlike what is taking place in the Ukraine, where the rest of the world can see first hand the events in Kiev. What is it that CNN has done to warrant being read the riot act by the President of Venezuela? While the world can see what is taking place on the ground in the Ukraine via their television, the world doesn't have that same ability in Venezuela. I don't follow every TV station stream originating from Venezuela, but it seems to me, none of the local TV stations are broadcasting events as they happen. What is at stake in the Bolivarian struggle for popular benefit of natural resources has ramifications for democracy and the citizen commons inside the United States as well. The visions of a militarized future are those being fostered in that country, a new variant on corporate government and 21st century fascism. You are a voice of truth in a world full of lies and disinformation spread by the imperialists who seek to dominate and destroy all that exists for good in this world. I am ashamed to acknowledge that I am an American. Ashamed that the citizens of my country are for the greater part a gullible, wholly misinformed, ignorant group who blindly facilitate my governments evil intentions. I fully understand my country is controlled by the darkest of forces. Shame upon it. Congratulations eva very good letter iam following my chief commander till 1992 and feel sad about what happening now. Do you allow different opinions or this one, as any other leftist blog, only permits vivas and haleluyas??? Believe me, I've got plenty of reasons to be skeptical. I've tried to ask questions at Cubadebate from Cuba, for one, and a couple of official blogs to no avail. I wonder how do you expect people to believe their opinions and ideas will count if they can't say what they think in a blog????? Whenever I speak about Venezuela people bring up consumer goods shortages - flour, sugar, toilet paper, car parts, medicine. I haven't been to Venezuela since 2007 so it's hard for me to discuss this issue. Are there shortages? How severe are they? How much more expensive have basic consumer good become?